Julia Clancy-Smith's unprecedented study brings us a remarkable view of North African history from the perspective of the North Africans themselves. Focusing on the religious beliefs and political actions of Muslim elites and their followers in Algeria and Tunisia, she provides a richly detailed analysis of resistance and accommodation to colonial rule. 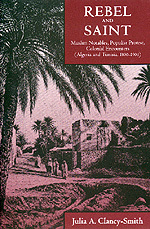 Clancy-Smith demonstrates the continuities between the eras of Turkish and French rule as well as the importance of regional ties among elite families in defining Saharan political cultures. She rejects the position that Algerians and Tunisians were invariably victims of western colonial aggression, arguing instead that Muslim notables understood the outside world and were quite capable of manipulating the massive changes occurring around them. Julia A. Clancy-Smith is Associate Professor of History at the University of Virginia.